This park bench has a terrific view of the Calgary skyline and it is also the site of a joyously offered and joyfully accepted marriage proposal. The customers love rich, radiant colors and that works well with a theme of delight. They also love to travel, so there is a compass buried in the foreground foliage as well as a tiny jet heading off to parts unknown. 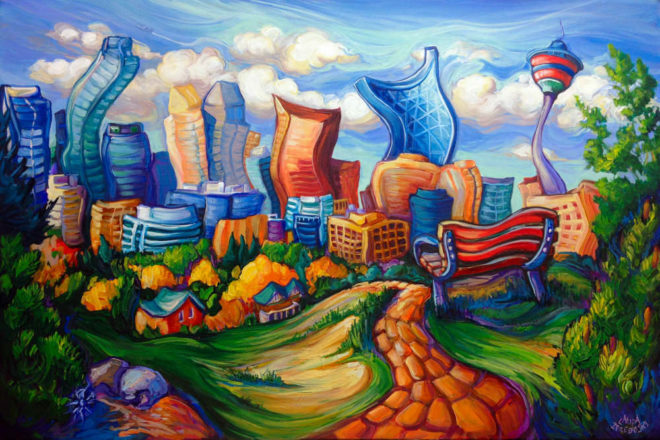 The main points of interest in this scene are the bench itself, the path leading up to the bench, and the Calgary Tower beside dancing skyscrapers. I also added some those dramatically beautiful clouds that Calgary always seems to have and placed highlights so everything seems to glow. Everything points to the park bench: the light, the curved path, the swirling greenery and even an implied heart shape in the grass. I wanted to create a sense of going on a journey but also arriving at a destination.